Eight-year-old Dipali’s Mother thought her sweet and loving child would never be able to walk properly again. Dipali Das was born with a deformity: her feet pointed outwards contrary to the way normal feet are supposed to be. She could neither walk or stand properly and fell down before she could walk even two steps forward. Born into an extremely poor family in Gosaba, in a remote village in the Sunderbans, her father, a fisherman, was badly wounded when attacked by a tiger and could no longer support his family. Baba’s compassionate heart opened when he heard of this beautiful child’s suffering and after her surgery to correct her deformity, Baba decided that LDLM would bear the cost of her corrective shoes till she is able to get back on her own feet. 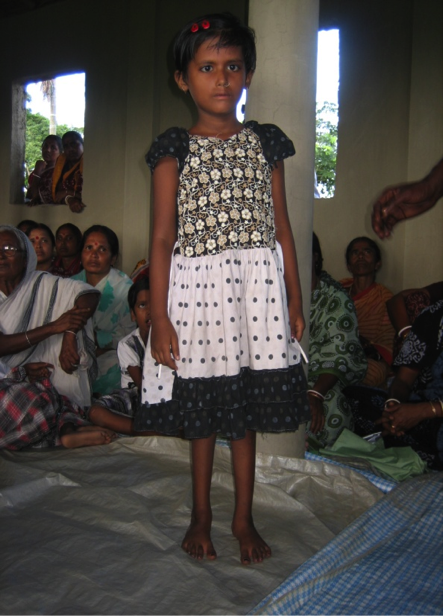 The girl was brought to Kolkata and fitted for proper shoes which, along with her Mother’s loving massage, and coupled with exercises, she can now dream of walking normally one day. Within the last one month of treatment from the Doctor the mission consulted, her new shoes and mother’s massage she has miraculously improved and can walk much, much better than ever before, as you can see in her photo. Dipali also suffers from the nerves in her eyes drying up. Again, Baba’s loving Mission has taken up the responsibility for her eye treatment as well. Her eyes are now much better after consulting the Mission’s hospital for children's eye care and being under the direct care of the best doctors. Dipali, which means light, has certainly brought light into the lives of all who have treated her, with her sweet spirit to try again and again.